Unfortunately summer is slowly winding down in Sydney with today being the official start of Autumn so we’ve been trying to barbecue as often as the weather allows. We tend to mainly grill red meats such as steak, lamb and pork but for some reason we often over look cooking chicken on the grill, especially whole chicken pieces, which is a shame as chicken on the bone is perfect for the grill. Maybe the hesitance springs from memories of backyard barbecues where the chicken served is either raw or completely burnt, but with a little care that needn’t be the case. This dish is based on the barbecue flavours of the South with a sticky, smoky barbecue sauce which I also use on my ribs. The chicken is coated in a flavourful dry rub and left to marinade overnight (an hour or two will also do) and then lightly coated in oil before being put on the grill. 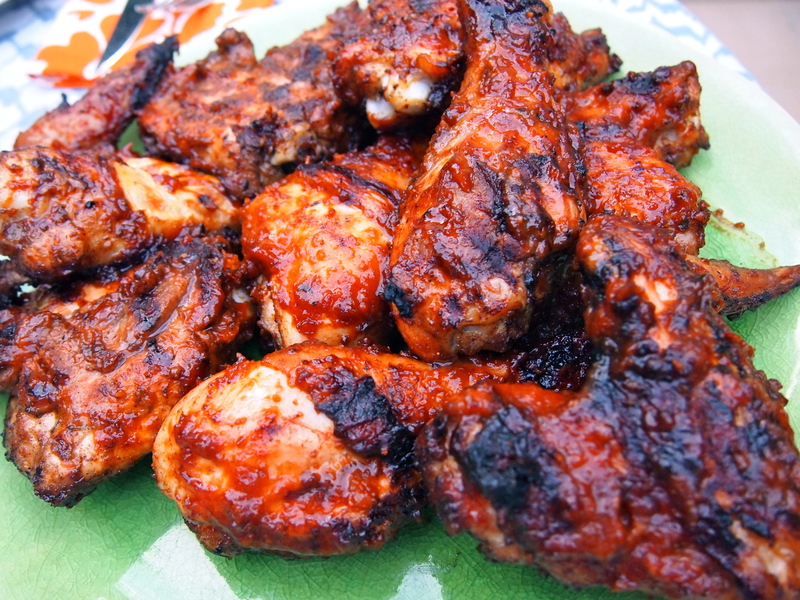 The chicken should be three quarters cooked through before it can start to be basted with the barbecue sauce. Any sooner and the sugars in the sauce will burn the chicken before it’s cooked through. 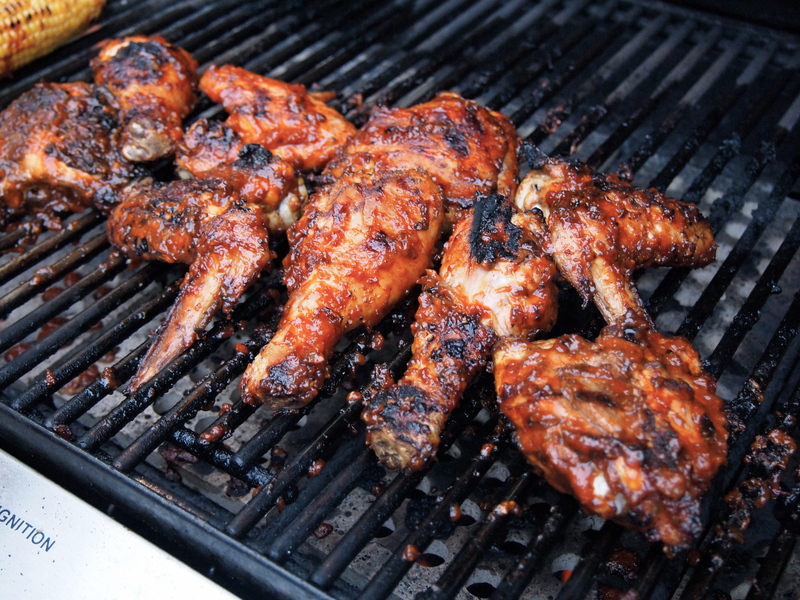 The best way to set up your grill for cooking chicken is to do the first part of the cooking process on an indirect heat, with the lid down for the majority of the time, to create an oven-like effect. At the point when you start basting the chicken with the sauce you can put it over direct heat and cook it a bit more fiercely. I’ve also been known to cook the chicken in a foil covered baking dish in in the oven for about 30-35 minutes before placing on the barbecue for the final basting and cooking. Either way you’ll be left with moist and tender meat with a burnished barbecue glaze that’s finger lickin good. Serve with baked potatoes, grilled corn on the cob, coleslaw and lots of napkins! 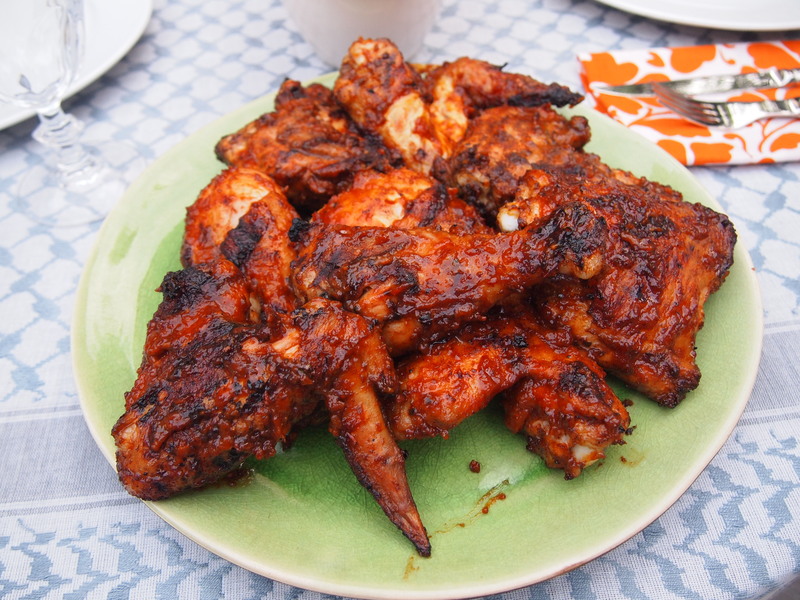 6-8 chicken pieces – I like to use a combination of drumsticks, thighs and wings. I find breasts dry out too much. Place the ingredients for the dry rub in a large bowl and stir well to combine. 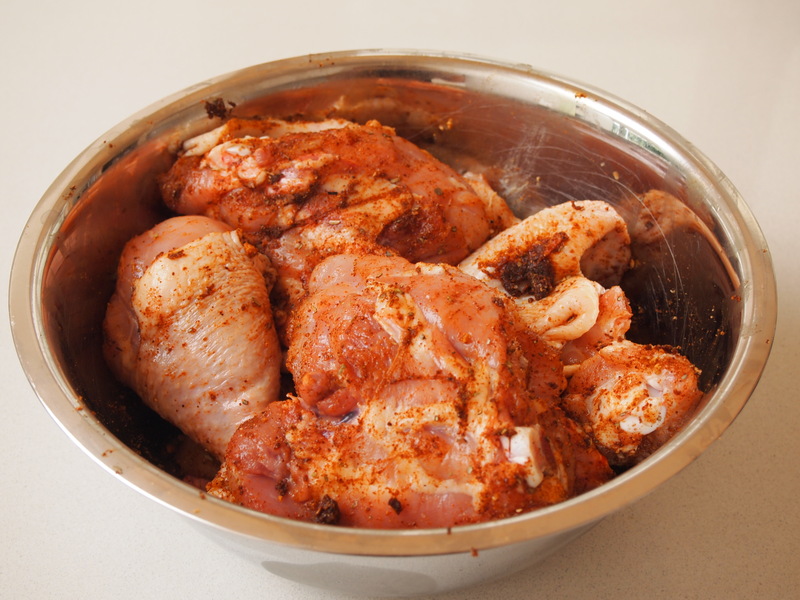 Add the washed and dried chicken pieces and massage the spices into the chicken, ensuring each piece is well coated. Cover and refrigerate overnight if possible but an hour or two will also suffice. Take the chicken out of the fridge and let it come to room temperature. Add the oil to the chicken pieces and rub it in well. Heat and set up your grill for indirect cooking and cook the chicken pieces, turning regularly, until they are almost cooked through. You should have the lid of the barbecue down for most of the cooking time; how long it takes will depend on the heat of your grill but it should be around 20 minutes. Alternatively you can preheat your oven to 180C and bake the chicken in a foil covered baking dish for 30-35 minutes. Once the chicken is almost cooked, move the pieces over the direct flame and start basting the chicken with the barbecue sauce. If you’ve done the first part of the cooking process in the oven then remove the chicken from the baking dish and place on a hot grill over a direct flame. Keep basting and turning the chicken until you have a nice glaze. It’s important to keep turning the chicken pieces over as the sauce starts to set and to keep basting. It should take about 10-12 minutes for the chicken to finish cooking and to achieve a nice glaze. Place the chicken pieces on a platter and let it rest for about 10 minutes before serving.